Check out these three tips to know before installing a new fence. A new fence installation is one of the best ways to add privacy, security, and safety to your property. However, there’s much more to fencing than installation, so it’s important to make sure you choose the right fence for your yard and family. Continue reading for three tips to know before installing a new fence to ensure it meets your needs and add value to your property. You want your new fence to be high-quality and professional installed, so it’s important to take the time to do some research. Look for a local company in your area who has years of experience, great customer reviews, a range of services, and quality materials and workmanship. Look at their website for organizations they are a part of, such as the American Fence Association (AFA,) Maryland Building Industry Association (MBIA,) or the Associated Builders and Contractors, Inc (ABC.) 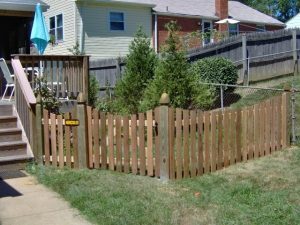 Hercules Fence Washington DC is a member of all of these associations, and is considered the best fencing company in the area! It is also crucial to choose a company that offers fence customization. While you may not think that a custom fence is necessary at first, it is a crucial factor for installing a fence that fits perfectly with your home. At Hercules Fence, we offer custom wood fences and offer extensive styles and options. Our skilled team will work with you to find the right fence that offers privacy, security, and decorative needs. We also know the importance of environmental awareness, which is why all of our lumber meets or exceeds industry standards, as well as conforms to the latest EPA requirements. Before hiring a fence company to install your new residential fence, it’s always smart to take a look at their work. The company should post photos on their website of residential and commercial projects to show potential customers what they can expect. On Hercules Fence DC’s website, you will find a gallery of photos for every type of fence we offer, including wood fences, automated gate systems, ornamental steel fences, and many more!